A course for abrasive wheels training. Be sure to meet all legal requirements while learning to change and select the correct blades. Increase your skills. This training course is suitable for everyone who is required to change blades on abrasive wheel devices such as Chop Saws, Angle Grinders or Cut-Off Saws, as part of their daily duties. 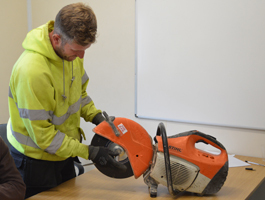 To make sure that you understand the legal requirements under the Provision and Use of Work Equipment Regulations (PUWER), the basics of blade selection and the correct procedure for changing a blade. You will be tested on your knowledge during a practical session. You will receive certification of training that is valid for three years.